Max Allegri will be without Andrea Barzagli, Martin Caceres, Angelo Ogbonna, Patrice Evra and Kwadwo Asamoah but Andrea Pirlo may be fit enough to start from the bench for Saturday night’s game against Lazio. The Bianconeri are going through something of a defensive injury crisis with Giorgio Chiellini being the only fully fit centre back. Leonardo Bonucci featured for the Azzurri midweek and limped off with a suspected adductor strain but was quick to reassure fans in the press conference following the game. Allegri is expected to continue with a back 4 following two impressive results in the space of a week, including that 7-0 demolition of Parma. The tactician spoke about the change in tactics and the quality of his squad in an interview with Gazzetta Dello Sport this morning. With that in mind, Stephan Lichtsteiner is expected to start at right back with Simone Padoin filling in at left back for the injured Kwadwo Asamoah and Patrice Evra. Claudio Marchisio may start in place of Pirlo with Paul Pogba and Arturo Vidal joining him in a central midfield 3 with Roberto Pereyra just behind a front pairing of Carlos Tevez and Fernando Llorente. 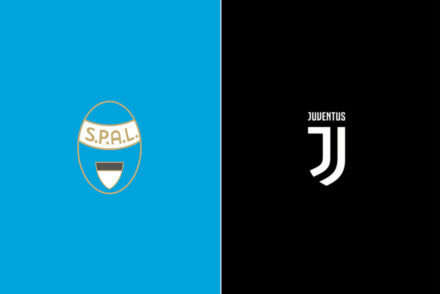 Lazio haven’t beaten Juventus in the league since 2003 but boast an impressive home record this season with 4 wins and 1 loss at the hands of Udinese. Lazio had a slow start, but once they figured out the concepts of the new coach Stefano Pioli and his 4-3-3, they flew high. They are in fifth position with nineteen points: they lost the last game on the road against Empoli, but that’s probably only a physiological stumble after a six-game streak of positive results. At home, they have won four game and lost only once against Udinese, in September. They have the second best attack in the League and it’s easy to pinpoint why: Antonio Candreva and Filip Djordjevic have been in stellar form so far. The winger has already dished nine assists, while the Serbian striker has scored six goals. In the last two seasons, Candreva has been the driving force of Lazio and the right flank is really an area of concern for Juventus, since Patrice Evra is hurt and Kwadwo Asamoah is banged up. Picking the right player to contain the Italian international will probably be the biggest challenge for Allegri. Pioli has experimented a lot to find the right complement for Candreva and Djordjevic in the attack, also because Baldo Keita has been injured. They skilled youngster should be able to go on Saturday, but his presence from the start is not guaranteed at all. Stefano Mauri has been pretty good (three goals so far) thanks to his sneaky cuts and his above average smartness. Senad Lulic is a powerful and tactical option, which would also guarantee a higher work rate. Felipe Anderson hasn’t been very good, but Pioli showed confidence in the Brazilian attacker, while Ederson has just returned from an injury, but he has already scored. Mauri, who’s probably the primary option at this point, has a sore thigh. His potential absence could rush the return of Keita in the starting XI. A fit Keita is handful for any defender. The choice has some corollaries. Should Pioli pick Lulic to complete the trident, it would mean that Ogenyi Onazi will be fielded in the box-to-box midfielder position, where the Bosnian usually plays. It would make the midfield even more muscular than usual. Lucas Biglia, who has played extremely well after the World Cup, and Marco Parolo, who confirmed the good level of performances he had reached at Parma, are set to be the other two midfielders. All in all, their defense represents their weakness. It’s only a relative weakness, since the whole squad is fundamentally sound, but the quality of the defense is not at the same level of the other two departments. Dusan Basta and Stefan Radu return from injuries and they’ll battle with Luis Pedro Cavanda and Edson Braafheid, who held their own so far, to start on the flanks. Lazio lost Santiago Gentiletti early in the second, whom they envisioned to pair up with Stefan De Vrij in the heart of the defense and the alternatives haven’t been really convincing. On the other hand, the Dutch centre-back, who was the most touted purchase of the summer, has been playing really well after a really tough start. Mickeal Ciani seems to have picked up an injury, so it’s likely that the midfielder-turned-defender Lorik Cana will start: not the fastest guy in football, but very pugnacious and aggressive. After a dark moment, Federico Marchetti seems to have beaten the competition from Etrit Berisha on goal. 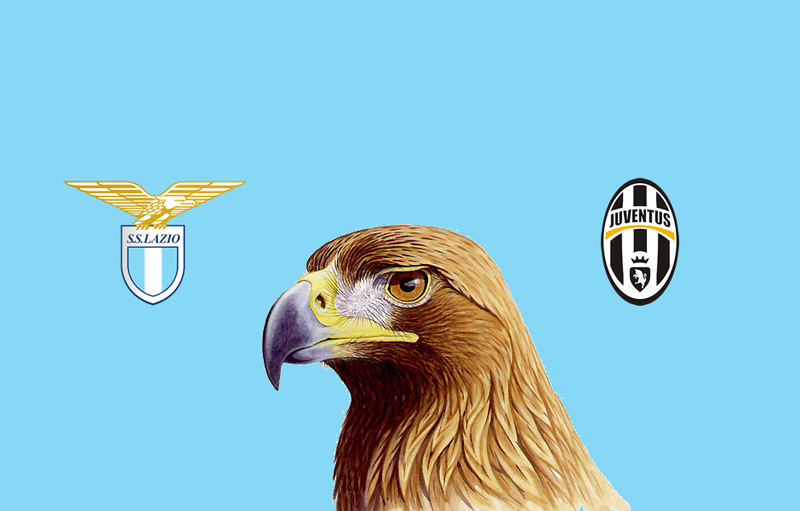 Facing Lazio before the key Champions League match against Malmoe is really unfortunate and definitely not ideal. 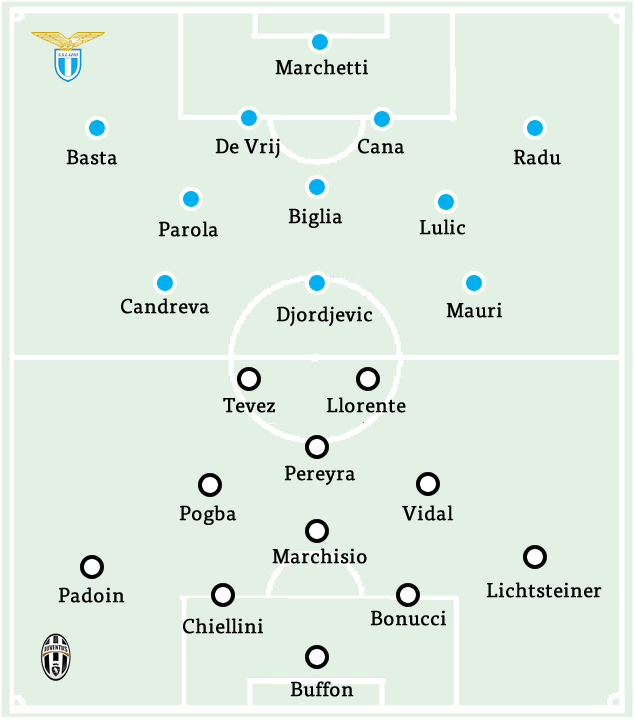 Lazio will really test Allegri’s new scheme by attacking down the flanks and trying to expose the defense with sharp crosses and quick counter-attacks after recuperating the ball. 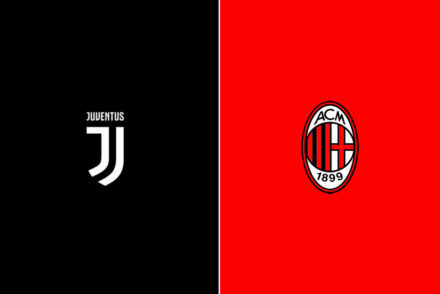 It will be a challenging match for Juventus.